Asking whether there are limits on the stories we tell about ageing parents seems foolish in an era where everything is shared online – though some are asking whether today’s parents are oversharing the lives of their children. Yet while some older people are happy to broadcast their lives, by and large my parents’ generation valued privacy and keeping up appearances. How far should I honour that, in their memory? One answer is that those stories are as much ours as theirs. The three years in which my parents became ill and died were incredibly intense. I could talk forever about the experience, still, nearly ten years on. I rerun the worst moments, smile at the best, and know just how much I learnt from it. About practicalities but also about death and dying. Whether we plead, “Please God, let me not come to that!” or “May I too end my days that way”, in thinking about a parent’s death, we begin to come to terms with our own. Another answer is that it’s necessary to tell their stories as a call to action. Many stories publicly shared by adult children focus on neglect, abuse and suffering, and its vital that they speak up. 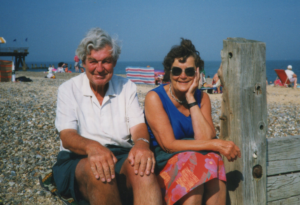 Like Nicci Gerrard and Julia Jones setting up John’s campaign to allow relatives to stay overnight with someone with dementia, a campaign born out of Nicci’s father’s experience. I could use the story of my mother learning to write again as a reminder not to give up on older people who’ve had a major stroke, and to fund effective rehabilitation. I think she’d approve of that, but I’m being selective. What would my mother really have wanted me to share? Not pathetic – in her eyes – post-its showing her disabilities, but her love of Jesus and commitment to the church. Except that story takes me to an uncomfortable place, where I felt judged for being the wrong kind of Christian. Whether to share private details about parents who are beyond consent is a real question. Asking why I want to share those stories has to be part of the process, and it is definitely challenging.